Enjoy 4-days, 3-nights accommodation at the Luxor Hotel and Casino. You'll also receive FREE & VIP entrance to night and dayclubs, a walking tour of the Las Vegas Strip, and optional excursions to Stratosphere and Fremont St. You'll also have the chance to upgrade to include tours to the Grand Canyon or to see one of the amazing shows Las Vegas has to offer. Meet your tour guide in the lobby of the Luxor hotel to receive a room key, wristband and the schedule. Visit The Buffet at Luxor for an optional Thanksgiving dinner experience. 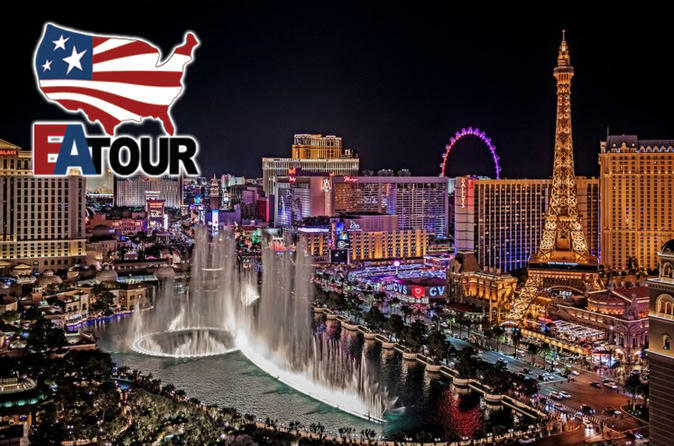 Get settled in the hotel and prepare to go on our bus tour to explore the vibrant "Sin City". Get a TRUE VIP Entrance to one of the biggest nightclubs in Las Vegas, you will skip the long lines, be welcomed and receive free entrance to the nightclub. Wake up early for the optional Grand Canyon, helicopter-, plane- or walking tours. Explore Las Vegas with your friends and end the day with free VIP entrance to another big nightclub in Las Vegas. Enjoy the Fremont Street Experience (Downtown Las Vegas) and check out the many shows the Las Vegas hotels have to offer. End the day with free VIP entrance to yet another big nightclub in Las Vegas. Check out of the hotel in the morning and explore Las Vegas at your leisure!